This report sets out recommendations in the form of building blocks for effective CFC rules. The recommendations are designed to ensure that jurisdictions that choose to implement them, have rules that effectively prevent taxpayers from shifting income into foreign subsidiaries. 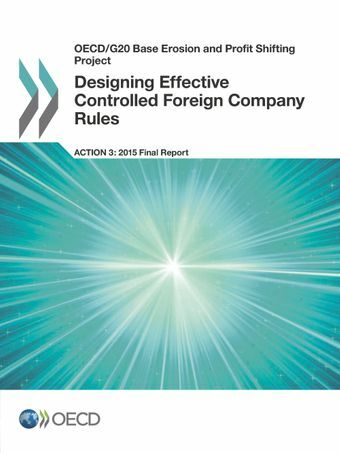 The report sets out the following six building blocks for the design of effective CFC rules: (1) definition of a CFC, (2) CFC exemptions and threshold requirements, (3) definition of income, (4) computation of income, (5) attribution of income, and (6) prevention and elimination of double taxation. Because each country prioritises policy objectives differently, the recommendations provide flexibility to implement CFC rules that combat BEPS in a manner consistent with the policy objectives of the overall tax system and the international legal obligations of the country concerned. Base Erosion and Profit Shifting (BEPS) refers to tax planning strategies that exploit gaps and mismatches in tax rules to artificially shift profits to low or no-tax locations where there is little or no economic activity, resulting in little or no overall corporate tax being paid. Watch an example of how the OECD/G20 BEPS Project will revise the international tax rules.